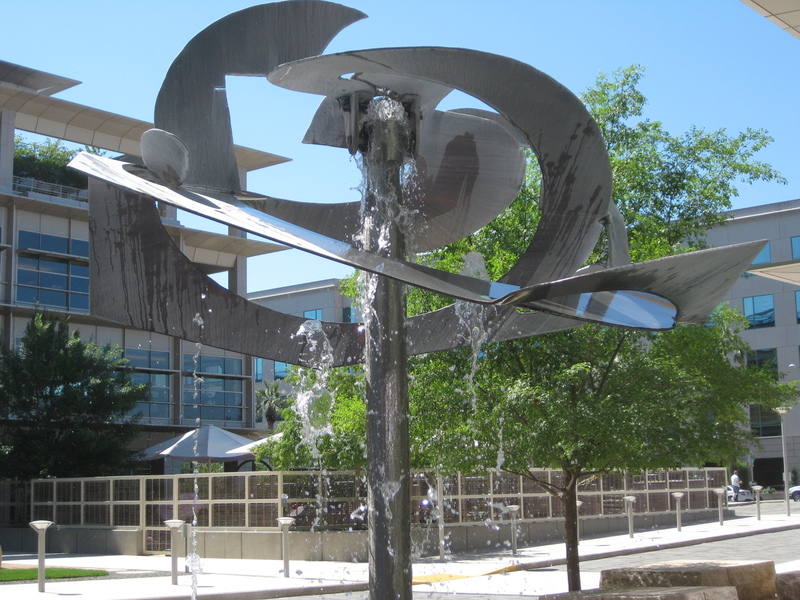 Although I’m still discovering the numerous art fountains throughout the downtown area, I’m willing to bet that Serendipity by Mark di Suvero would win in the category of “Most Fun Fountain”. 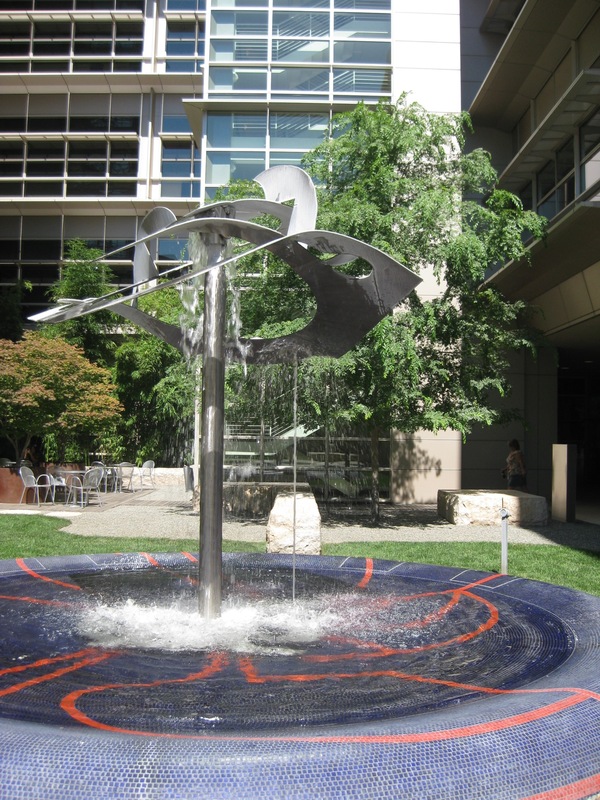 Serendipity sits in the park-like area near the entrance to the CalPERS building at 400 Q. 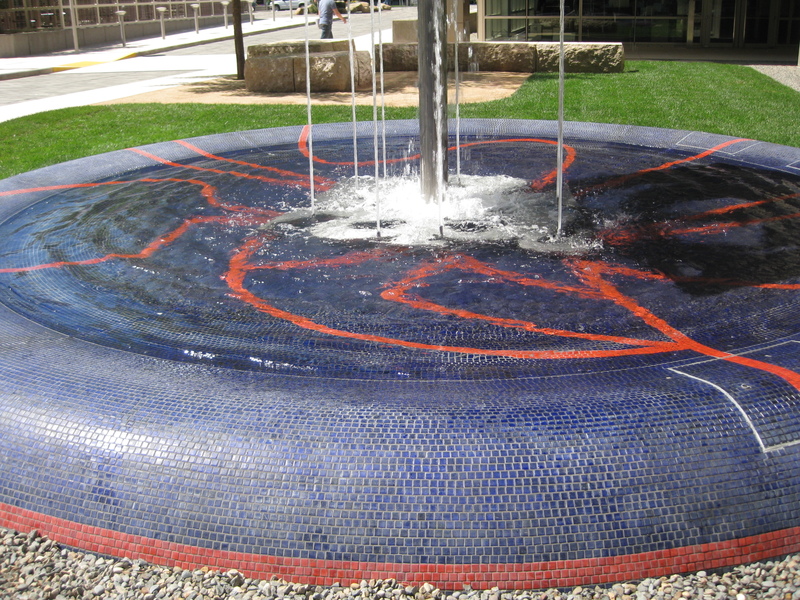 The spiraling shape of the top sculpture, the varying water jets, and the mosaic tile pool are all fun and interesting, but the piece goes beyond the amusing shapes and colors. Nearby is a keyboard control so you can play with the jets to make the top sculpture move and sway in response to the jets. 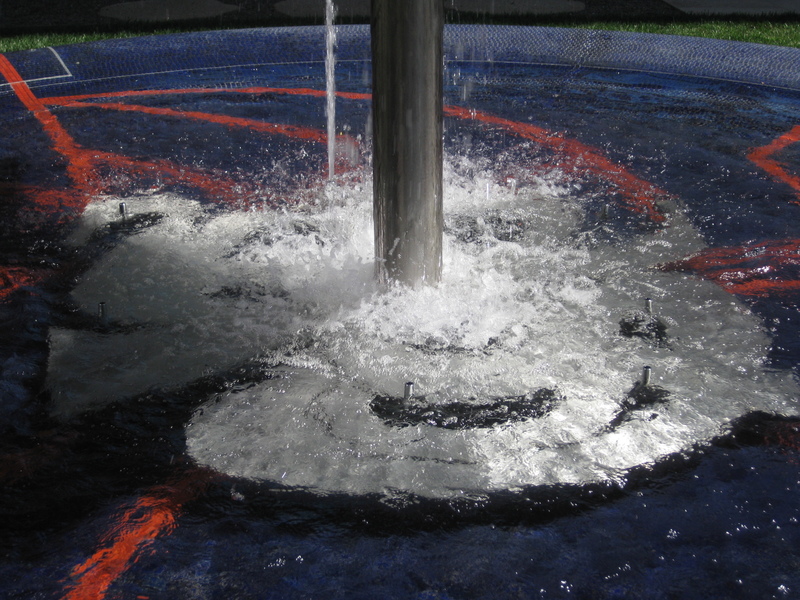 There is a great photo of the fountain when it was brand new on the flickr page of SLDdigital, and in the photo you can clearly see the mosaic pattern and metal element for the jets. 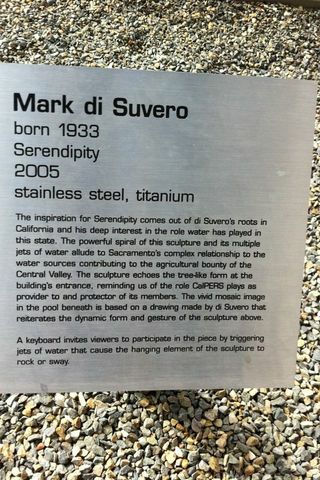 The inspiration for Serendipity comes out of di Suvero’s roots in California and his deep interest in the role of water has played in the state. 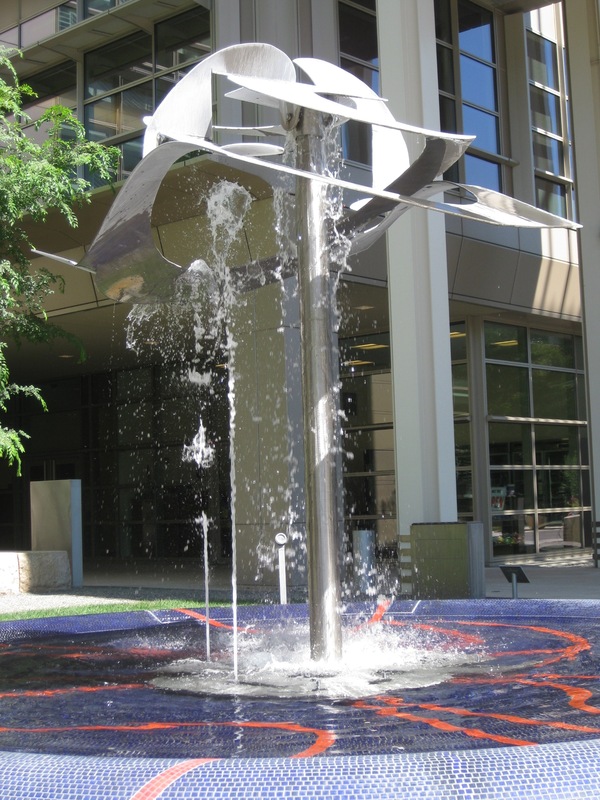 The powerful spiral of this sculpture and its multiple jets of water allude to Sacramento’s complex relationship to the water sources contributing to the agricultural bounty of the Central Valley. 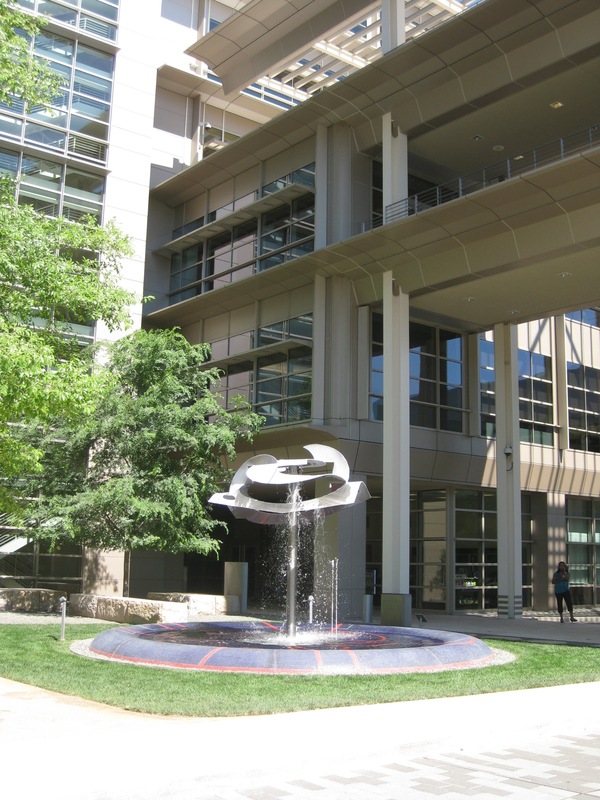 The sculpture echoes the tree-like form at the building’s entrance, reminding us of the role CalPERS plays as provider to and protector of its members. 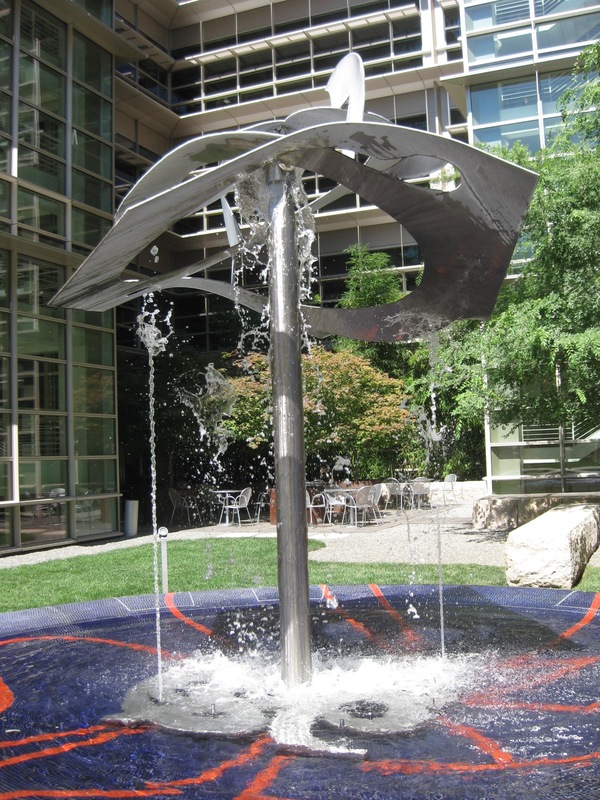 The vivid mosaic image in the pool beneath is based on the drawing made by di Suvero that reiterates the dynamic form and gesture of the sculpture above. Last March di Suvero was honored at the White House by President Obama with the National Medal of Arts (1). An online article quotes Obama praising di Suvero: “Exhibited throughout the world, Mr. di Suvero’s exemplary sculptures depict a strong political and social vision, demonstrating the power of the arts to improve our world” (2). While exploring di Suvero’s works, I learned about Storm King, a 500 acre sculpture park 1 hour north of NYC with works by di Suvero, Andy Goldsworthy, George Rickey, David von Schlegell, and over 100 other artists. This fabulous looking park is now on my list of places to visit during my lifetime. Motu Viget is another of di Suvero’s fun sculptures. Located in Grand Rapids City, the sculpture is a large steel form with a massive rubber tire suspended in the air and is known popularly as the “Di Suvero Swing” (3). A flickr site has a good photo of the entire sculpture. This Grand Rapids Press article describes the history of Motu Viget, which was created in 1977, and includes a close-up photo of a couple playing on the swing.